In 1966 Tom Burgess was elected to the House of Assembly , with Joe Smallwood’s blessing and the promise of a Cabinet seat if he won the Labrador West District. The Cabinet Seat was not forthcoming, and Tom, with many of his constituents, became increasing discontent with the disproportionate levels of Government revenue removed from the Iron ore rich district and the minute levels of government expenditures in the “company” towns of Labrador City and Wabush. By 1968 Tom had crossed the House to sit as an Independent Member, and begun to form a political party as a support base within his district. His New Labrador Party gained a surge of support in the Labrador North District in 1969 when Smallwood came to Happy Valley to announce that the anticipated wood chip mill which was to feed the new pulp mill under construction at Stephenville would not be built in the Lake Melville area. Strong District Executives of the New Labrador Party were organized through 1970 in Labrador West and the Happy Valley/Goose Bay section of Labrador North. No organization was carried out on the coast of Labrador, North or South until July/August of 1971, in anticipation of an upcoming election. In the months of August and September Tom Burgess and Frank Pye visited the Labrador Straits region and began organizing the Party: Herb Brett, Frank Pye, and Jerry St. John contested the Labrador North nomination, with Brett winning by one vote: and Mike Martin accepted the Labrador south nomination. Two realities should be noted in the consideration of these election results. Roy Legge had been appointed Minister of Labor and Melvin Woodward the Minister of Labrador Affairs by Smallwood in the weeks preceding the election. In the meantime, Joe Harvey had become a local folk hero in Labrador South by running against Smallwood’s selected candidate for nomination and thereby becoming in a very real sense the first Newfoundland politician to beat Smallwood in an election, albeit nomination, process. The Provincial election results left both Frank Moores and Smallwood unable to form a Provincial Government, and Tom Burgess holding a one seat balance of power. Much has been said and written about this period. The grim reality is that by January, 1972, with a Provincial election a foregone conclusion, and Smallwood stepping down as the Liberal Leader, the Provincial Liberals plotted Burgess’s political death. Probably at Smallwood’s suggestion, the Provincial Liberal Executive members, and at least one prominent Federal Liberal contacted Tom, advising him that he was the only suitable candidate to succeed Smallwood and carry the Liberals to victory in the upcoming election. Burgess was able to persuade his Labrador West Executive that he would in fact become the Province’s Premier, with many resultant benefits for Labrador. The Labrador North District Executive perceived the plot, but could not, even with Mike Martin’s personal entreaties, persuade Tom to withdraw from the Provincial Liberal Leadership race. Forsaken by his Liberal ‘supporters’, Burgess suffered a total defeat at the Liberal Leadership, lost the Labrador West seat in the election, and by mid summer collapsed in a physical and mental breakdown in Ireland. Three realities are apparent in these results. Tom Burgess, while carrying a fairly strong personal support, had destroyed any confidence the public may have held for the New Labrador Party in Labrador West. Herb Brett had not been able to carry the Party’s cause to a successful victory in either election in Labrador North, which had denied the Party the significant influence it would have had if the October election had provided two New Labrador Party members in the short lived balance of power period. Mike Martin, on the other hand, was constantly gaining support in Labrador South, where the most important act of the entire New Labrador Party, and the most beneficial political action in Labrador’s history, occurred.. The even split in Labrador South was resolved by a By-election rather than a recount when it was discovered that some election irregularities had occurred, even to the extent of recently dead individuals “voting” in the March election. The by-election was called for August 31, 1972 by the Premier, Frank Moores. The Premier, and every one of his Cabinet Ministers, visited Labrador South and campaigned on behalf of Ed Kearsey, the PC candidate. Kearsey was promised the post of Minister of Labrador Affairs upon winning the by-election. The election result stunned the majority PC Government. It has to be noted that this result was achieved by the New Labrador Party and Mike Martin after the Burgess defection and immediately after the Labrador North Candidate had lost two elections. The Moores Administration recognized that some serious action must be taken in Labrador, and less than two months after the August by-election the Royal Commission on Labrador was appointed, chaired by the Director of Extension Services of Memorial University, Donald Snowden. In 1974 the Royal Commission reported to the Moores Cabinet, presenting 288 recommendations which covered every aspect of life in Labrador. 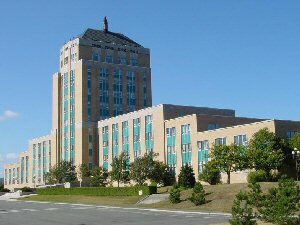 The Moores Administration, recognizing the impossibility of addressing the concerns raised by the Royal Commission’s recommendations from Provincial revenues, but vividly aware that Labrador’s needs must be acted upon, negotiated a series of Federal/Provincial Agreements. These Agreements, often funded at 90/10% by the Federal Government, and in the case of the Labrador Airstrip Program reaching the rate of 110% funding federally, (100% for the construction and 10% for the Province to administer the Program) went far beyond the relatively modest “platform” of the New Labrador Party. The Party had accomplished all, and more, than it had set out to do. However, in the meantime, Mike Martin had resigned his seat before the end of his term in office with a vivid expression of his personal distaste for the political process of government in general, a very real personal debt incurred by the expenses of three election campaigns in less than a year, and probably a lack of faith in the Royal Commission process. Given the blow delivered by the Party’s “originater” in Labrador West, the repeated failure of the Labrador North candidate to win an election, and the rapid progression of improvements along Coastal Labrador which changed a “honey bucket society” into bathroom communities, it is not surprising that the few remaining enthusiasts were unable to reorganize the Party Indeed, in the 20-20 perception of reviewing history it can be argued that the invisible but clearly present threat of the emerging Labrador self-consciousness may have presented a greater pressure on the Provincial Government of the period than the actual presence of several New Labrador Party Members in the House of Assembly would have done.